So how much does it cost to rent a storage unit? According to online storage marketplace SpareFoot, the “national average monthly price for all unit sizes is $87.15 a month, and the average price per square foot is $0.97 per square foot.” However, your storage unit’s price tag will greatly depend on a variety of factors, including where you’re renting the unit and how long you’re renting the unit. If you’re thinking of renting a storage unit from a reliable facility, you’ll need to budget appropriately. Below we’ve laid out the different factors that affect the cost of renting a storage unit, as well as a price comparison of both self-service and full-service storage units. What determines the cost of storage? Location – When renting a self-storage unit, the location of the specific storage facility is a big factor in determining the price. Those living in large urban areas may find that their facilities are more expensive due to high demand. If this is the case, consider renting a storage unit in a nearby suburb. Prices may be lower in less dense areas. Time – The amount of time you rent the storage unit is another major factor in determining the price. In general, self-storage facilities tend to offer rentals on a month-to-month basis. Some even offer the first month free. This flexible monthly pricing structure allows the customer to store their items temporarily without a making a long term commitment. In our opinion, this the most convenient option. Contracts offered by full-service storage facilities vary from company to company. Some insist on a 3 month minimum, while others offer month-to-month services. Size – The amount of stuff you have will determine how large of a storage unit is needed. Many self-service and full-service storage facilities offer storage units in various sizes to accommodate a wide-range of storage needs. Just remember: the larger the storage unit needed, the higher the monthly cost. So before throwing all of your belongings in storage, I recommend sifting through your things first. Purging unnecessary items will help bring down the cost of your storage unit. Level of service – Generally, self-service storage facilities cost less than full-service storage facilities. This is to be expected given that full-service usually includes pick-up and delivery. Add-ons – If you decide to purchase storage bins or packing supplies from the storage facility, your overall cost is going to increase. Several storage facilities offer customers the option of purchasing labor assistance as well. Items stored – If you’re looking to store your boat, car, motorcycle, RV or other unusually large item, you may need to pay extra for additional room in the facility. Insurance – Most storage facilities require customers to have insurance. For many customers, storage items can be covered by their homeowners or renters insurance. However, Trusted Choice points out that “off-premises home insurance coverage often has a limit of $1,000 or 10 percent of the policy’s personal property limit, whichever is greater.” For those without insurance, the storage facility should be able to help you sign up with a storage insurance provider. U-Haul – U-Haul is one of the most popular and easy-to-find self-storage facilities in America. Facilities are secure and climate controlled, with 24-hour access to customers. U-Haul offers convenient month-to-month storage rentals, as well as five different storage unit sizes. For reference, renting a small storage unit from U-Haul typically costs anywhere from $60 to $80 a month. Public Storage – With thousands of locations throughout the U.S., Public Storage is a convenient option for many looking to store their belongings. The company’s storage facilities are climate-controlled with drive-up, walk-up and elevator access. Public Storage offers customers month-to-month storage plans and seven different size storage units. For reference, renting a small storage unit from Public Storage may cost anywhere from $12 to $50 a month. 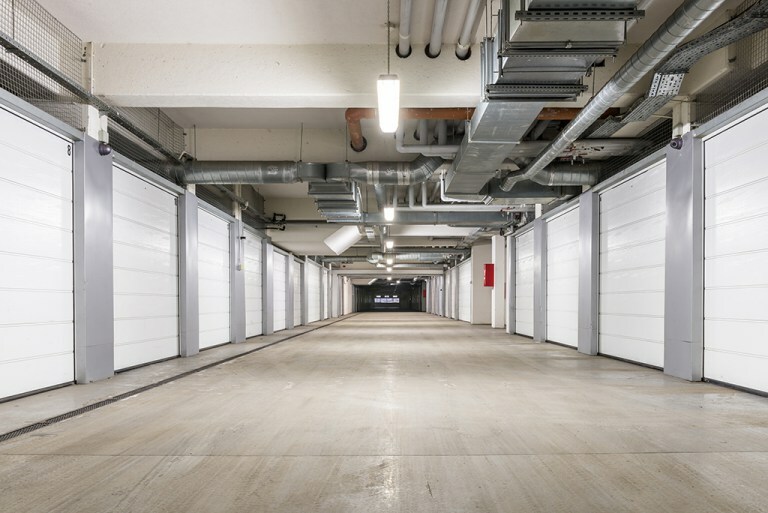 Extra Space Storage – Extra Space Storage offers climate-controlled storage facilities, as well as a well-lit environment and state-of-the-art security features. The self-storage facility’s units come in eight different sizes. Extra Space Storage offers month-to-month rental plans. For reference, renting a small storage unit from Extra Space Storage will cost between $20 to $100 depending on location. CubeSmart – With 800 facilities nationwide, CubeSmart is a well-known self-storage facility. CubeSmart offers convenient month-to-month storage leases for each of its six different size storage units. The larger the storage unit needed, the more expensive your monthly rental will be. The pricing also varies from one storage location to another. For reference, renting a small CubeSmart storage unit tends to cost anywhere from $30 to $70 a month. Clutter – Clutter is available in Los Angeles, San Francisco, New York, New Jersey, Chicago, Seattle, San Diego, Santa Barbara and Orange County, California. The full-service storage company offers six different storage plans. Customers can either choose a plan that offers a one month minimum or a plan with a 12 month minimum. Labor for pick-ups and deliveries starts at $35.00 per mover, per hour with a one hour minimum. RedBin – RedBin is available in New York City. The full-service storage company charges customers $5.00 per storage bin (each 3 cubic feet) monthly. Seasonal items, such as golf clubs, skis, and AC units cost $25 per month to store. Redbin also provides all transportation services for free on the first order. Cubiq – Cubiq is available in the Greater Boston Area. The full-service storage company offers customers a slightly different pricing structure “designed with volume discounts in mind,” according to the company. Customers can purchase cubes individually or they can purchase one of three plans: Tier 1 ($29 per month for 4 cubes), Tier 2 ($59 per month for 8 cubes), or Tier 3 (16 cubes per month for $99). MakeSpace – MakeSpace is available in New York City, DC, Chicago and Los Angeles. The full-service storage company offers customers several different size storage unit, as well as the choice between a 3 month or 12 month minimum. MakeSpace’s prices vary by city, however, so be sure to check your specific city for details. Trove – Trove is available in the Greater San Francisco Bay Area. The full-service storage company charges customers based on the square footage needed. The rate is $2.50 per square foot per month. However, a four month storage commitment and 50 square-foot storage minimum applies. This includes packing materials, all packing, moving, and monthly storage. Whether you need a place to put belongings for the short-term or long-term, renting a storage unit from a reliable facility is the best way to store your things before, during and after a move. Renting a storage unit also provides a great space-saving solution to those whose homes are overflowing with stuff. To find storage in your area, use Moving.com’s Storage Center. Just type in your zip code or city and state of residence, and click the ‘find storage’ button. Moving.com will pull quotes from the closest storage unit facilities near your new or old home to compare. If you’re moving to a new home, you may also need reliable movers to help out. To find the best moving company to move your belongings, check Moving.com’s extensive network of reputable and reliable movers. All relocation companies in our network are licensed and insured, so you can rest assured that your move will be in good hands. Best of luck and happy moving!